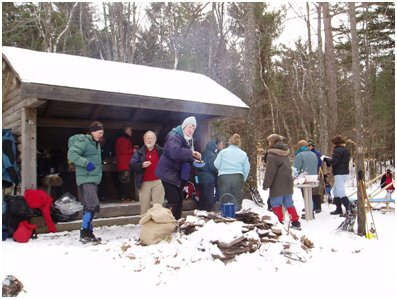 Snow shoe cookout: Carol Traver led a January 26 snowshoe hike from Cotton Hill Road to Durfee Road on Long Path Section 32. 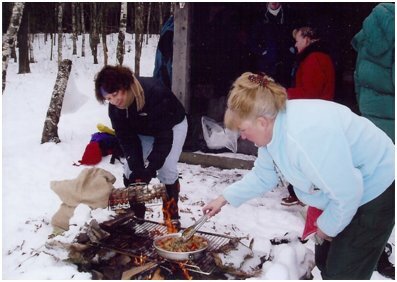 Fifteen members made the snowy trip and everyone brought something to contribute to the feast. We stopped at the lean-to at noon and built a campfire. As we waited for our campfire to turn to cooking coals, we enjoyed baby carrots, chips, dip, cheese, crackers, and various spirits. We soon had hot water and made soup. 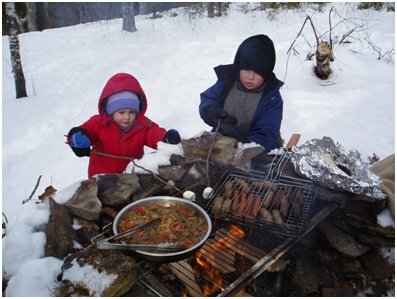 Next we grilled hot dogs, sweet sausage, saut�ed peppers and onions, and heated the baked beans. Desserts followed with oatmeal cookies, ambrosia, brownies, smores and of course toasted marshmallows! We ended the snowshoe hike with a waddle to our vehicles! It was a wonderful way to defeat cabin fever and enjoy a great meal with excellent company and have lots of laughter! Thanks, everyone for sharing all the delicious treats! PS: Those calories didn�t count because they were burned off! 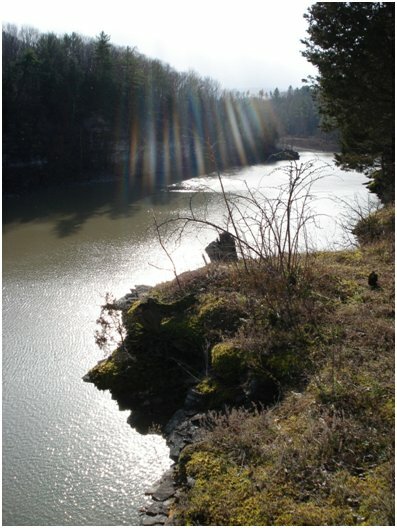 Equinox Hike: Dan Kwiatkowski�s March 21 hike was a picture perfect spring day! 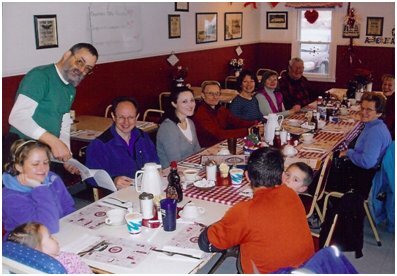 We met at the Middleburgh Diner for a scrumptious breakfast. After breakfast we carpooled to Gilboa. We hiked from the Route 990V Bridge to Nickerson�s Campground where we were met by the owners, Mr. & Mrs. Brown. They were busy preparing the grounds for the summer season. We expressed our deep appreciation for allowing the Long Path to cross their beautiful property along the Schoharie Creek, this is a wonderful setting to take the whole family camping, fishing, swimming, boating and hiking! 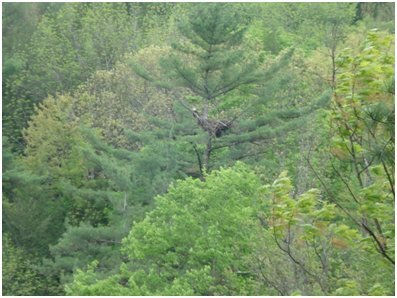 Just past the campground, we spotted the eagles nest! It is about 7 feet across, high up in a pine tree which is wrapped with a predator guard to keep varmints out. The ground was littered with fur balls, feathers and the skeletal remains from their meals. From a viewpoint further down the trail, the adult eagles were seen sitting high in the tree and the eaglets were hopping around in the nest. What a rare and spectacular sight! We continued on to a sunny sheltered plateau where we had a beautiful view of the Schoharie Creek below. 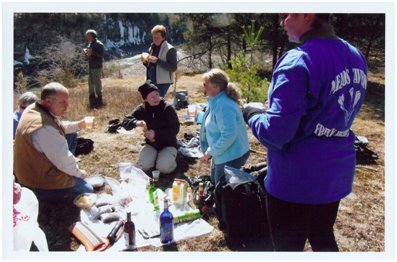 Our hiking packs and boots were quickly removed and we settled in for a picnic lunch and celebrated the first day of spring. 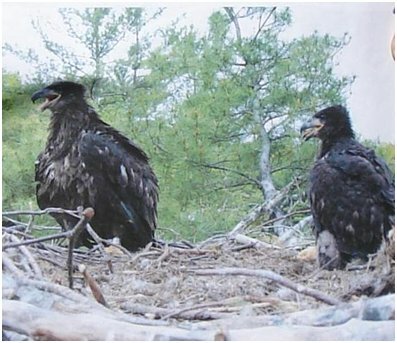 Upon our return, the Brown�s met us again and shared pictures and information on the bald eagles and eaglets gathered by Department of Environmental Conservation when they leg banded the fledglings. Our hike ended at the petrified tree display near the Gilboa Post office, where we had time to read the informative kiosk and see the ancient tree stumps. With all the smiles and hugs at the end of the hike, it was clear that everyone enjoyed the day! Thanks Dan and everyone that brought goodies to share at our spring fling. Yippee, spring is here! 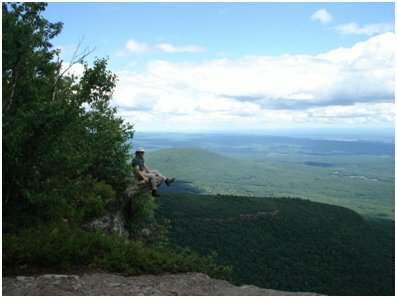 Huckleberry Point: Harold Guest, Jr. led us to one of his favorite spots in the Catskills in June. We arrived just as the Mountain Laurel was in full bloom - what a treat! The trail was exploding with large white clusters of florets that resembled snowballs all along the trail! 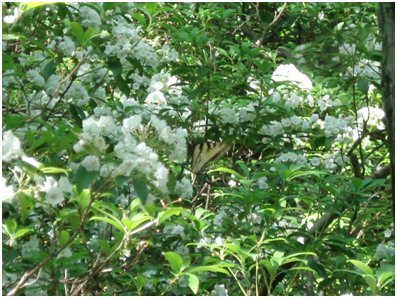 At some spots the Mountain Laurel was so tall we disappeared under arches of white blooms. After leaving the breathtaking splendor, we entered a pitch pine forest where the scent of pine intoxicated us with its aroma. We found time to explore the area and located a boulder that appeared to have a small heart shape cut into it. Once at the ledge, we found the even rarer bright pink laurel in full bloom. At the ledge we also found ripe huckleberries (for which the area must have been named) and they made a nice snack after our lunch. Leisure time was allowed to enjoy the vista of the Hudson River and view towards the Shawangunk Mountains in the distance. Our return trip was a splendor in reverse! Mt Utsayantha: Clarence Putnam led a hike in July to the historic observatory on Mt. Utsayantha. We meet at TP�s Dinner in Stamford for breakfast and then drove to the road leading up to the fire towers. Our hike started at the intersection, just before the monument that marks the gravesite of Utsayantha (an American Indian woman). At the sharp curve in the road, we took the foot trail that leads up through the woods, past an old spring and well house. 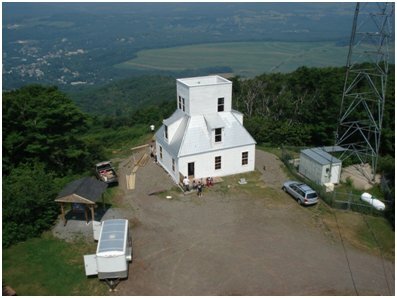 We continued up and eventually circled the peak where we found volunteers replacing the deck of the old observatory. The building was open and we were allowed in and up to the roof, where we enjoyed a stunning view of the Village of Stamford. 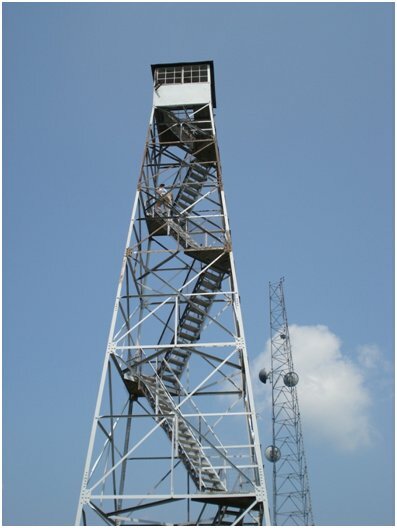 Next we climbed the new metal fire tower for a 360 degree view from the cabin at the top. We also toured the side trails before returning to the observatory for one last look around, before heading down a "proposed" trail to Route 23. The volunteers were just finishing their lunch and offered us their surplus pizza! After repeated arm-twisting, some of our group decided to lighten the volunteer�s carry-out load. We did feel guilty about not earning it by helping with the deck work, but this faded quickly as we headed down the trail stuffing our faces with hot pizza! We thank Clarence for perfectly timing the only hike on record where free hot pizza was our reward for making the summit!!! 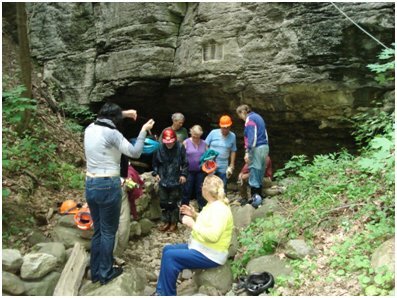 Beat the heat hike: Carol Traver found a way to beat the heat and humidity of July - she led a hike in the caves. Our excursion started with breakfast and conversation at the Middleburgh Dinner. Our first stop was at Secret Caverns and we descended the 103 steps into the cave. The temperature quickly dropped from 82 to 52 degrees - instant air conditioning! We navigated the lemon squeeze and headache rock, saw the fingerless hand, the elephant�s trunk, the monster, little Niagara Falls and the 100 foot waterfalls. Next we stopped at Doc Shaul�s spring and learned that the pond is actually a 300 - 350 foot deep cave system that carries water from Secret Caverns to the Cobleskill Creek. We had lunch at the Fox Creek picnic area and relaxed a little before we carpooled to the Schoharie Show Cave. This is currently a "wild" cave, which means there are no walkways or electric lights. Everyone checked their flashlights and put on helmets. The first few steps into the cave entrance caused some hoots and hollers because it required stepping into an ice cold stream. We sloshed in knee to thigh deep water past flow rock, remnants of stalactites and stalagmites, slid past a lemon squeeze, climbed over a rock dam and arrived at a 45 foot underground waterfall. The cave hike turned out to be a cool success that caused some of our most reserved members to laugh, giggle and utter some very interesting excited comments! 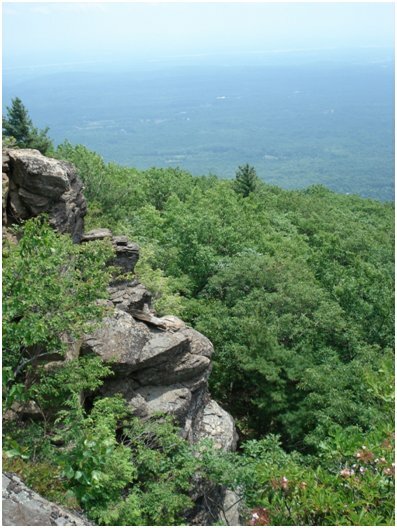 Summer Fun: Mark Traver picked a beautiful day for an August hike and picnic! We had breakfast at the Middleburgh Dinner, where we enjoyed chatting about the prospects of the day. After breakfast we carpooled to Hunter where we arranged to meet more of our group. 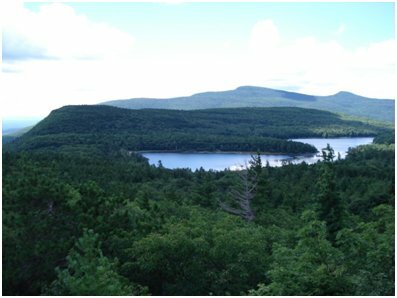 We proceeded to the North-South Lake Campground where Mark led a leisure four mile hike past Artists Rock, Sunset Rock, Lookout Rock, Newmans�s Ledge (where we had a light snack and enjoyed the view), Badman�s Cave and Ashley Falls. The group did some exploring among the cracks and crevasses of the numerous conglomerate rock formations. We also made lots of stops for picture taking along the way. We were glad to return to our picnic site and enjoy some cold liquid refreshments. Everyone brought something to share and we set up a picnic fit for kings! 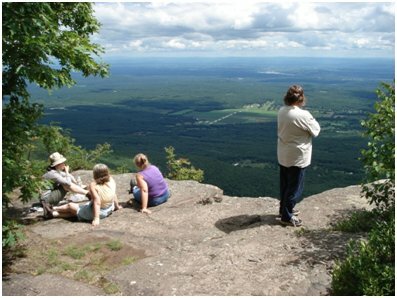 Afterwards, we strolled the short distance to the site of the Catskill Mountain House for more pictures and conversations along the ledge.